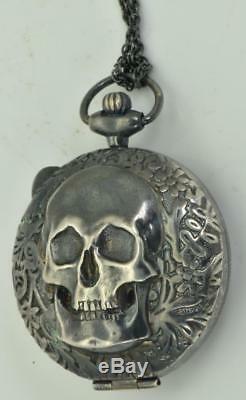 One of a kind Victorian silver MEMENTO MORI SKULL pocket watch shaped pill box. It comes with a silver chain. Excellent condition for its age This is. 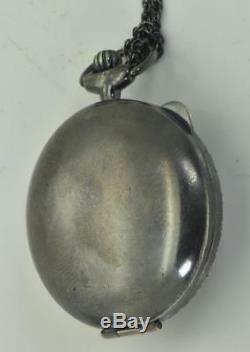 A link to the tradition of the memento mori - an object designed to remind us that life is brief and that we should seize the moment while we are here. 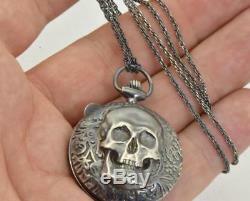 Since the beginning of time, the skull is been used as a symbol of mortality, victory, the ultimate Memento Mori. 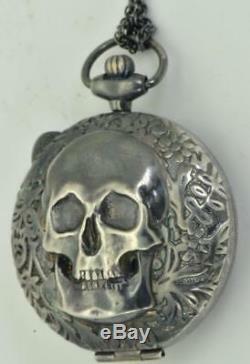 Provenance:This unique piece comes directly from the famous Skulls collection of Dr. Atanas Karamov, who was the personal physician to King Ferdinand I of Bulgaria. Karamnov was also a member of. The first Bulgarian Regular Masonic Lodge named Balkanska Zvezda c1890's. 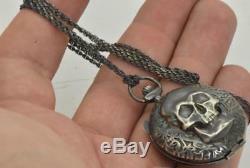 His collection contain over 1200 skull watches, skull goblets, skull victorican jewelry etc.. NOTE:PLEASE OBSERVE CAREFULLY THE PHOTOS! IT IS A SIGNIFICANT PART OF THE DESCRIPTION. Every potencial defect which is shown in the photos, but not mention in the description, will be considered for described. All the photos shoot by professional Nikon 105 Macro lens under 40x diopter magnification, so you can explore even the smallest detail like under microscope! Auctiva offers Free Image Hosting and Editing. 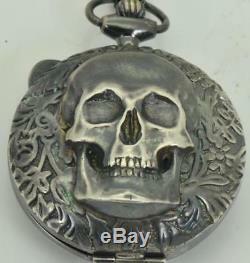 The item "One of a kind Victorian silver MEMENTO MORI SKULL pocket watch shaped pill box" is in sale since Monday, July 9, 2018. This item is in the category "Collectibles\Vanity, Perfume & Shaving\Pill Boxes". The seller is "riaerica2000" and is located in Sofia. This item can be shipped worldwide.